This transition is made more difficult due to a documented lack of engagement in the profession. A “Fast Company” article by Brandon Busteed references a Gallup poll stating that 69 percent of educators are engaged in their work and “teachers are dead last among all professions Gallup studied in saying their ‘opinions count’ at work and their ‘supervisors create an open and trusting environment. '” With these numbers, it’s no wonder that almost three quarters of teachers dread the coming school year. Teachers are not alone in the tumult of transition. This same Gallup poll found engagement drops dramatically among students as they progress through school. In elementary school, 76 percent of students feel engaged, while only 44 percent of high school students feel engaged. The lack of engagement among both teachers and students should alarm all educational professionals. It is hard to quantify the countless hours I spent modifying curriculum requirements to attempt a more engaging approach with students. Now I’m beginning to think we need to start reimagining the process, rather than enhancing the existing strategies. In his TedX video “The Surprising Truth about Learning in Schools”, Will Richardson quotes author Seymour Sarason when describing the learning process. Sarason wrote “Productive learning is where the process engenders and reinforces wanting to learn more. Absent wanting to learn, the learning context is unproductive.” The term “productive learning” resonated with me. In my career, I have struggled to instrinsically motivate students to engage with my curriculum. I used to joke, “if I could solve student motivation issues, I would be rich.” I even went before ND English teachers and presented various tools to help students engage with curriculum. I now think I was searching for solutions within the prescribed curricular box. 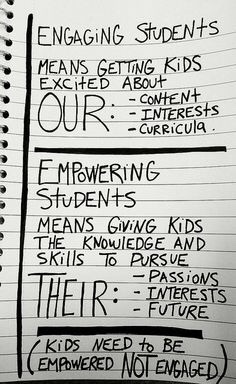 While reading George Couros book “Innovator’s Mindset” he discussed the topic of engagement. He writes “Engagement is a good thing, but I’ve since learned that we must also empower students and equip them with the skills to learn. It is imperative that we teach learners how to be self-directed and guide their own learning, rather than rely on others to simply engage them.” He uses this graphic from Bill Ferriter to clarify his message. Transitioning into the upcoming school year, I do not consider myself in the 69 percent of unengaged teachers (although that may have been true in the past). This is primarily because I’m in the process of reimagining my classroom. I’m hoping students will be surprised when they discover their student-centered English course is unlike anything they have experienced before. This will involve a student-centered approach where they will be managers of their own learning experience. It will involve professional community mentors to help students bridge that gap to their next steps. And it will involve authentic products for authentic, real-world audiences. Late summer has a new feel in my household. My wife, in her new role as a coach, is excited to assist new teachers in their quest to provide the best possible instruction for their students. It is also the first time in years where I have been excited to get back into the classroom. I’m always searching for new strategies and philosophies to provide my students an advantage upon graduation. Offering opportunities for “productive learning” will provide the transforming transition I need, but more importantly my students deserve. Jeremy Murphy is a journalism and English teacher at West Fargo High School in West Fargo, North Dakota. This blog represents his observations from his professional growth in his 11 year career. In no way should this be mistaken for advice or any form of professional expertise. If you are looking for an expert in teaching, English and/or life, you are on the wrong site. You can follow Jeremy on Twitter at @mr_jmurphy or email him at jpmurphy@west-fargo.k12.nd.us.